Dawn, August 19, 1942 the biggest cross-channel raid begins on the town of Dieppe. However the Germans are ready and waiting. Operation jubilee the raid on Dieppe, was the biggest operation of its kind carried out during world war 2. Ten major military units took part, the larger part of them Canadian. Casualties were heavy, only one formation succeeded in taking its objective, but the objective did succeed in answering one vital question that had been plaguing the Allied planners since Dunkirk, when it had first realized that in order to defeat Hitler and all for which he stood, an invasion of French coast had to be undertaken. The question was: would it be possible to capture a French port during the first days of the invasion? The attempt to capture Dieppe itself was made by six battalions and an armor regiment of the 2nd Canadian Division, landing at Puys, Pourville and on the Dieppe beaches between these villages. But on each side of this coastal stretch were batteries of coastal defense guns, which could blow out of the water any ships approaching the shore. To deal with this problem two British Commandos were landed No.4 on the west to destroy the batteries at Vasterival-sur-Mer and Varengville, and No.3 on the east to destroy those at Berneval. On August, 8 1942, 252 craft left four English south coast ports, the nine infantry landing ships carrying men of the Essex Scottish and Royal Hamilton Light Infantry, to land on the beaches of Dieppe Casino, of the South Saskatchewan Regiment and of the Queens Own Cameron Highlander of Canada to land at Pourville; and of the Royal Regiment of Canada to land at Puys. The 14th Canadian Army Tank Battalion and the Fusiliers Mont-Royal Marine ‘A’ Commando would assist in the capture of the headlands that dominate the exposed beaches. By 0335 n August 19 the convoys were off their objectives. The men were on their landing craft and an apparently unobserved approach to the shore was in progress. Then a burst of fire on the far left flank revealed that No.3 Commando had run into enemy shipping off Berneval and within minutes the whole length of the enemy defenses was on alert. Nevertheless, on the right flank the troops of No.4 Commando were carrying out a textbook attack. They landed on time and were well ashore and approaching their main target from two directions by 0540, had destroyed a machine gun nest, by 0607 and 0630 assaulted the main battery. The charges were placed, the guns blown up and No.4 Commando was back on board their craft and on their way home by 0730. At the eastern end No.3 Commando had emerged from the fight with enemy ships badly scattered and only on troop of 17 men and three officers was ashore on time. But they so harassed their target, the Goebbels Battery, with sniper and bren fire that the guns never opened up on the main assault taking place around Dieppe. They also were successfully withdrawn. 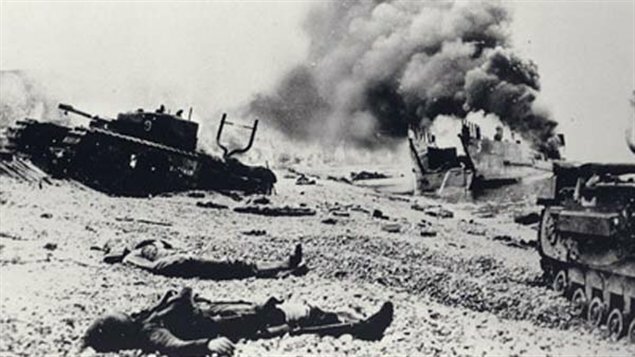 But between those two Commando assaults, total disaster had fallen upon the Canadians.Whether the Germans had prior knowledge of Operation Jubilee or not(and there is some evidence that they did), they had obviously anticipated an attempted landings on the Dieppe beaches and had prepared meticulously for it. Concealed heavy machine guns swept the approaches and then the barbed wire entanglements that ranged along the beaches between the sea and the promenade, and when the desperate survivors of the first landing divide for hollows in the sand and shingle, mortar bombs landed among them with a precision that spoke of careful preparation. Snipers coolly picked off anyone showing leadership, to such an extent that no commanding officer, few company commanders and fewer NCOs survived the morning, and the battle became a series of desperate actionsby individuals, most of whom were killed as soon as their purpose was seen or small groups isolated. The attacks on Dieppe itself foundered in the shallows and died on the beach. The Essex Scottish and Royal Hamiltons met such heavy fire that it was a wonder why any of them reached the prison camps, let alone returned home. Tank landing craft attempting to get in and give support were blasted as they emerged from the smoke, and their tanks hit as soon as the ramps went down. Nevertheless, 27 tanks did reach the shore and six ploughed through the wire to reach the promenade. One climbed the steps of the casino, and three moved along the promenade blazing away at the posts until they ran out of ammunition in the end were wrecked and most of their crews were killed. In ignorance of the true situation, the force commander sent in the reserves of the Fusiliers Mont-Royal and Royal Marines: but it was to no avail and these men were virtually thrown away. By 0900 the situation had been realized and an attempt was made to withdraw. The naval craft raced in and out, desperately trying to rescue men off the beaches, but the sacrifices were poorly rewarded: when by early afternoon on August 19 the ships finally withdrew to make their sorry was home, they left behind 215 Canadian officers and 3164 men, 279 Royal Navy or Commando officers and 726 British and ranks. They also brought back the answer to the vital question it was surrounding No! if a port was necessary in the first days of a great invasion, then the Allies must take one with them.